Last year, the Science and Technology Policy Institute (STPI) conducted an initial assessment of the viability of a private space station located in low Earth orbit (LEO). The study was conducted under the direction of the White House Office of Science and Technology Policy (OSTP). The full study (“Market Analysis of a Privately Owned and Operated Space Station,” by Keith W. Crane, Benjamin A. Corbin, Bhavya Lal, Reina S. Buenconsejo, Danielle Piskorz, Annalisa L. Weigel, February 2018) doesn’t appear to be publicly available. However, an executive summary is included in NASA’s International Space Station Transition Report, which I have reproduced below. direct purchase of space station services. The study’s executive summary follows. The Administration has set the goal of transitioning the International Space Station (ISS) to a model where NASA is one of many customers of a non-governmental enterprise that owns and operates a human-tended space station in low Earth orbit (LEO). This transition poses important questions about continued U.S. human presence in LEO. Is the private sector likely to take over and run ISS on a commercial basis? Or will governments, including that of the United States, continue to be the primary owners, operators, and customers for space stations? The purpose of this evaluation is to determine whether a future (i.e., 2025 and beyond) private space station could generate sufficient revenues from a variety of possible activities to cover the operations and capital costs of such an endeavor. We assumed that a private space station would be wholly owned and operated by private parties who would decide the station’s capabilities, the markets it would serve, and the prices it would charge for its services. We identified revenue-generating activities, envisioning the station as an industrial park in space where entities rent parts of the station for their activities. 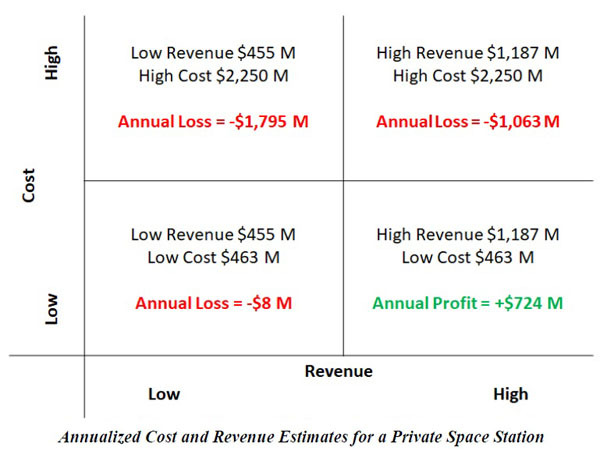 We then generated “high” and “low” estimates of revenues that the space station could earn by leasing space or providing services in support of these activities, corresponding to different sets of revenue-driving assumptions, although neither should be considered a strict lower or upper bound. We generated these estimates using inputs from interviews with over 70 experts, by examining current ISS activities, and by drawing on other sources to determine likely market size in order to develop separate cost methodologies for each posited activity. The analysis has had to incorporate a number of cost assumptions for the 2025 and beyond timeframe. Some of the most critical of these are: cost of launching an astronaut, about $20 million; encapsulated cargo, about $20,000 per kilogram (kg); and propellant transport, $5,000 per kg. These represent considerable savings over market prices when research for this project was conducted, between May and October 2016. STPI identified 21 separate types of activities that could generate revenues on a private LEO space station. These fell into five broad categories: (1) Habitats for space flight participants or government astronauts, (2) activities supporting the satellite sector, especially on-orbit assembly of satellites, (3) manufacturing products and services for use in space and on Earth, (4) research and development (R&D), testing, and Earth observation, and (5) Media, advertising, and education. The “low” estimate for total annualized revenues from activities conducted on a space station is about $460 million, and the “high” estimate is roughly $1.2 billion. Manufacturing in space is the largest contributor to overall revenues, accounting for nearly 35 percent of the “high” estimate and more than half of the “low”. Potentially profitable manufacturing of exotic optical fibers drive these revenues. Revenue from satellite support is 30 percent of total revenues in the “high” estimate. The large difference between the “high” and “low” estimates reflects the highly tentative nature of the cost estimates. Our methodology ruled out products and services such as growing human organs in space that we believe are more than a decade away from reality. Other challenges make our projections particularly uncertain, such as competition from other nations, new technology developments that negate the need for production in microgravity, and uncertain market growth patterns. While the projections are per force speculative, they do provide empirically-based assessments of almost all of the activities that have been discussed as potential revenue sources for a privately owned and operated space station. We next examined general types of space station configurations to determine ones that might best generate revenues. We developed cost estimates for a station constructed from ISS-heritage modules and one constructed from expandable modules. We also used a publicly available estimate of the costs of a Skylab-like station as a benchmark. 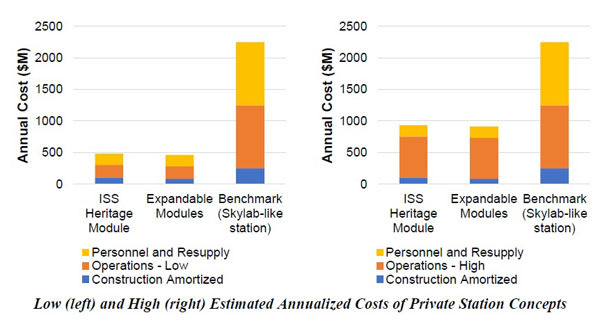 There are three elements in the breakdown of the annual cost estimate: (1) the costs of designing and constructing the station (amortized over 10 years), (2) costs of operations, and (3) costs to the station owner of transporting their astronaut employees to and from the station and resupplying them. Given the lack of consensus among our interviewees, we generated a low and a high estimate for operations costs. Neither estimate of annual revenues covers the estimate of annualized costs for the expensive benchmark station. Out of the four boundary scenarios, only in the high-revenue low-cost estimate would the station be profitable, as shown in the diagram below. Venture capitalists interviewed for the project noted that the projections of revenues and costs are so uncertain that they would have little interest in financing a space station until projected revenues show signs of actually materializing. A sensitivity analysis on the results showed launch costs to be the major driver of both revenues and costs. If launch costs were cut in half, either as a result of a technology breakthrough or a government subsidy, the estimates of revenues for the low-cost station would increase by 23 to 53 percent, for the “high”- and “low” scenarios, respectively, and costs would decrease by 16 percent. 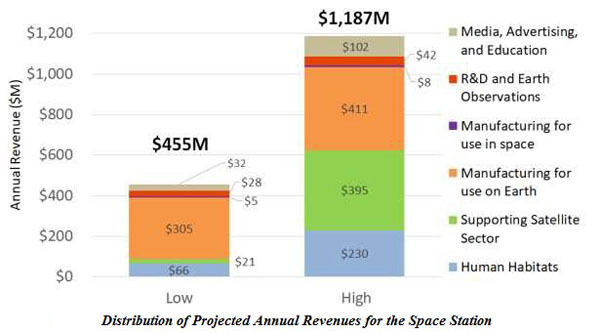 If the government subsidizes launch costs entirely, revenues for a low-cost private space station would go up by 46 to 106 percent, for the “high”- and “low” scenarios, respectively, and costs would decrease by 33 percent. Early stage investment through a public-private partnership: A private space station is inherently risky. The U.S. Government can participate as an investor in a public-private partnership with a space station owner and operator to ensure that the project comes to fruition and also to influence the design of the station to ensure that it fills NASA’s needs. The private partners need not be commercial entities; they could be a non-profit consortium of universities or other organizations with the ability to raise private funds. Advance purchase or lease agreements: Through advance purchase agreements and advance long-term lease agreements for a private space station, the U.S. Government could provide an early customer commitment to secure a guarantee-of-service at more favorable conditions than purchases at market prices after the station is completed. These policy instruments shift the outlays of expenditures closer to the time of delivery of the product or service than would a direct investment in the station. Direct purchases of space station services: The U.S. Government could choose to wait until a space station is completed and operating, then rent space for R&D or purchase other services provided by the station as needed. At that point in time, purchases of services would be at market prices that would likely be higher than prices provided for advance purchases. Services may also be subject to availability constraints; however, purchases on these conditions would offer the government flexibility, as the government would have made no commitment in advance to purchase services. 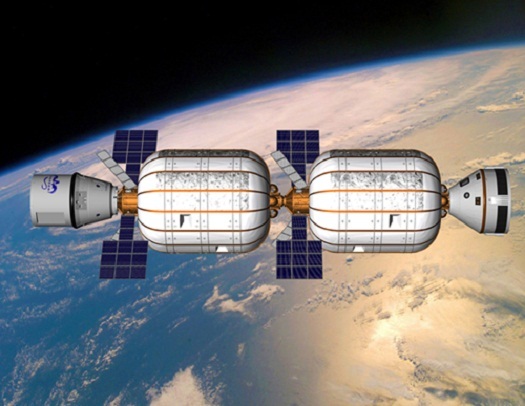 I would assume that the Chinese Tiangong station fairly well matches up with the legacy Skylab design. Is this report saying that is the most expensive design to build and operate ? Very interesting that the costs are so similar between the legacy ISS design and the expandable modules. I assume it all comes down to launch costs. Anyway I wouldn’t count out rigid body modules just yet offerings like axious aren’t headed by crazy alien hunters. Maintenance will be an issue with any station. Stuff happens. And the core of the ISS has been up there for 20 years. I assume there are all sorts of parts that can’t be found anymore. Why would you assume that? Skylab was its own weird monolithic beast there’s never really been anything like it before or since. Tiangong is more like if you tried to make a station out of something like a lone cygnus/ATV/HTV. So much so that they repurposed the design as a resupply vehicle for the next space station. That’s what I was thinking. It would be easier to contract to build new modules rather than trying to unravel all of the exterior connections on these modules that are all at least 10 years old. Unity is already 20 years old. Think of all the MMOD hits these things have taken. The real advantage of the ISS is the amount of power generated by those huge solar arrays. But I doubt those are moving either. There’s still some parts that’ll have some life left in them like the pmm, some docking ports, the future nanoracks airlock, and of course the cupola(you gotta save the cupola). A new core with power and propulsion is a must, but after a few salvage gigs might make sense. First off, understand that BA vs Axiom is not rigid body vs soft. BA is actually rigid once it is inflated and layers are flowed. The REAL difference in these is that Axiom is like a bug or exoskeleton, while BA has a inner skeleton. For BA330/2100, there is a central truss down the middle that acts like a spine and gives a rigid system from opening to opening. Genesis/BEAM do not have this because they do not have 2 openings. To be fair, the exoskeleton, like bugs/lobsters, really does not work well on large units like modules. OTOH, they really are needed for the connectors. Yeah, we are likely going to have both axiom and bigelow and ideally ILC/D in this. Hopefully, once we realize what a waste of money axiom is on modules, we will use them just for connectors. These make great sense to me. need to build out a habitat module on ISS and test it and then raise it to say 300 miles up, and attach more modules to each private system. Until we see numbers it’s hard to say whether either is a waste of money, both have pros and cons, and it’s not clear if it will be one station of different commercial modules or multiple run by the companies producing the hardware. But Tiangong is also just a single launch / non-modular station. Maybe the Chinese didn’t have the same launcher to put a Skylab-sized beast into LEO, but the concept of a single module station is the same. BEAM has a future as space junk. What purpose does it serve in the future other than maybe as a storage closet ? It doesn’t have it’s own power / ventilation. There are no fixed structures to mount anything to, and it’s doesn’t even have windows so you could pretend it was a copula. The real advantage of the ISS is the amount of power generated by those huge solar arrays. Old tech, degraded in space. Starting fresh you could get the same power from a third of the area. No consideration of revenue from hosting a fuel depot. Big oversight? Also, without considering what the astronauts are there for, it’s hard to say how many might pay to be there. I assume “space flight participants” is code for hotel guests, but how many are needed to support manufacturing and satellite assembly? What assumptions are made about ongoing operations to the Moon or maybe Mars? Since launch costs dominate, how does choice of orbit affect support costs? What about supporting asteroid mining? This study is not all that imaginative.